The materials library has a small cabochon gem that appears to be made of a preternaturally hued agate. But the source for this gem is not the natural world, but the man-made. And the source is quite surprising. 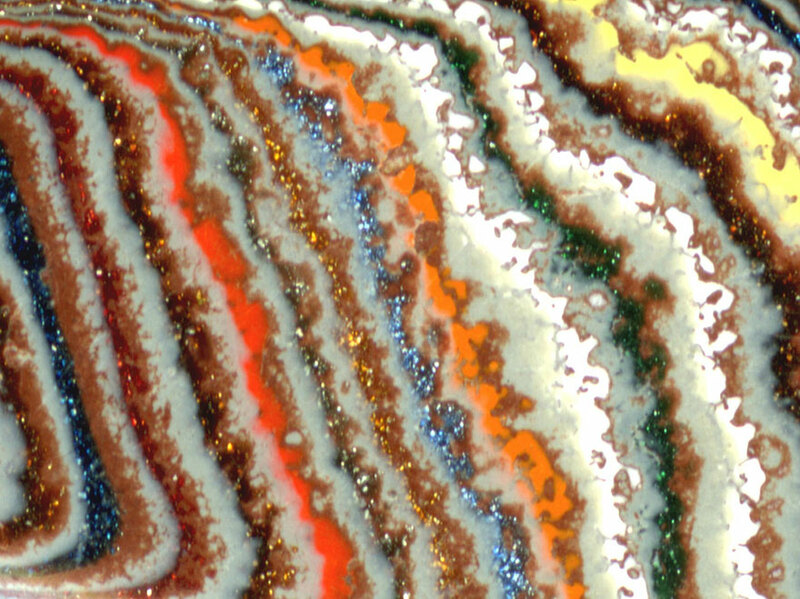 The cabochon in question is made of Fordite also known as Detroit agate or Motor City agate. This material is so-named because it is composed of layers of paint from car factories where automobiles were spray painted by hand prior to the introduction of modern practice of powder coating. 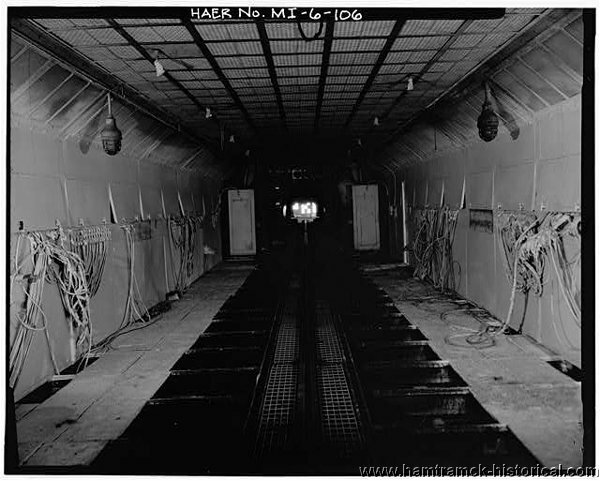 The cars moved along tracks and the enamel was baked onto the car and the tracks simultaneously. 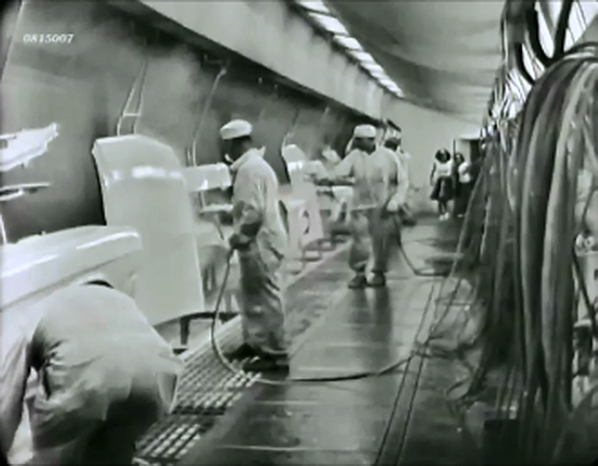 Car after car moved along the track being painted with a multitude of colors which accumulated as hard deposits. 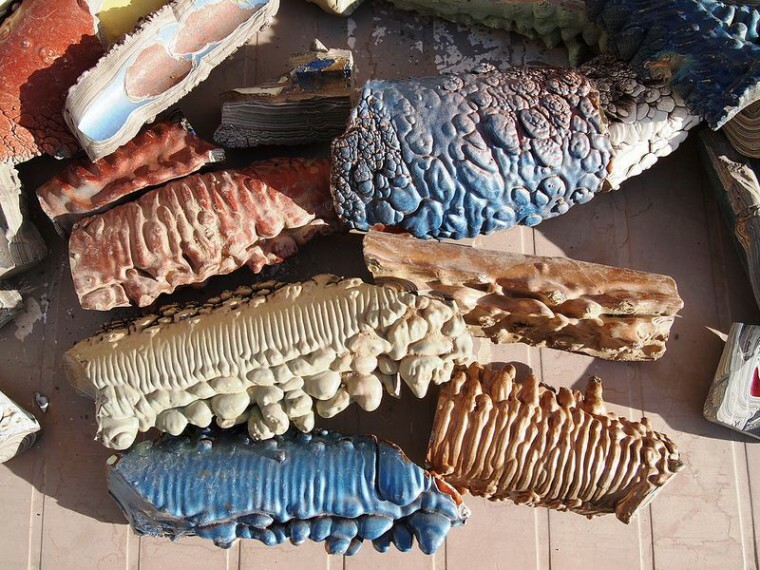 After the paint had formed thick layers of variegated color, it was chipped off in chunks to clean the rails. 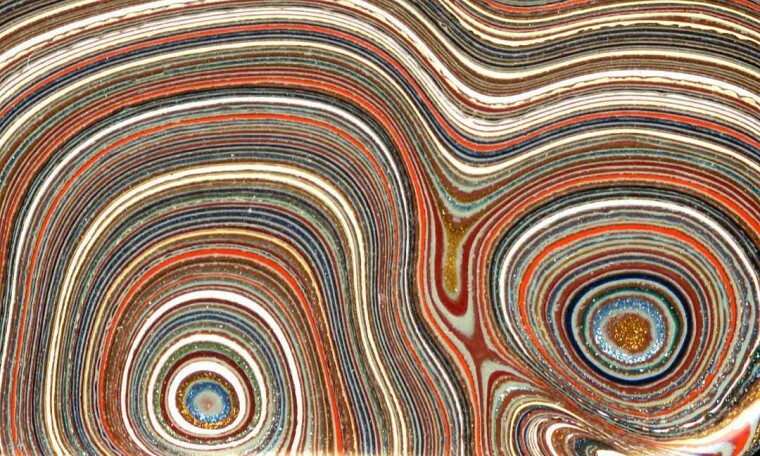 According to a GIA Gem News article, a 1 inch thick piece of Fordite represents 997 coats of paint. 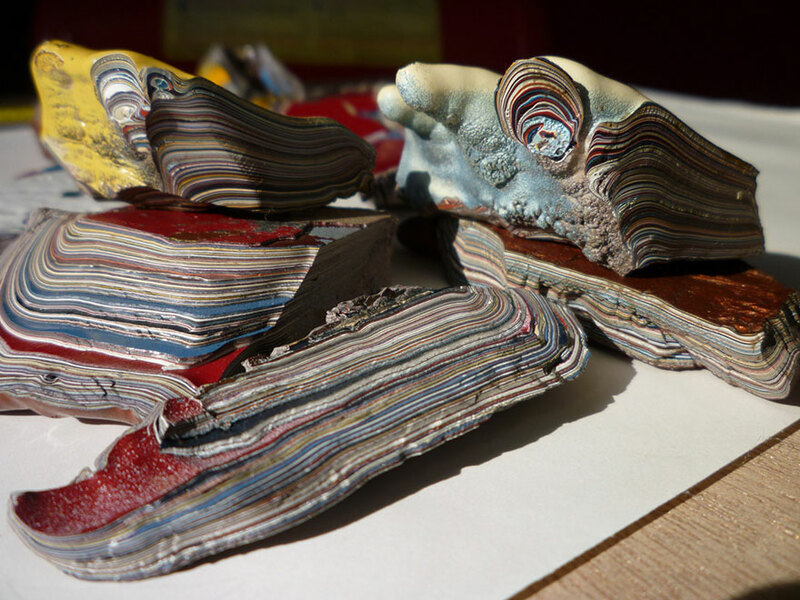 The same source also reports that Fordite was first collected from the Ford Motor Company in Michigan in the 1940s. Collectors especially prize specimens from the 1960's and 70's as this period has the most colorful paint. Samples from plants such as River Rouge where brilliant metallic paint was used also command a premium. 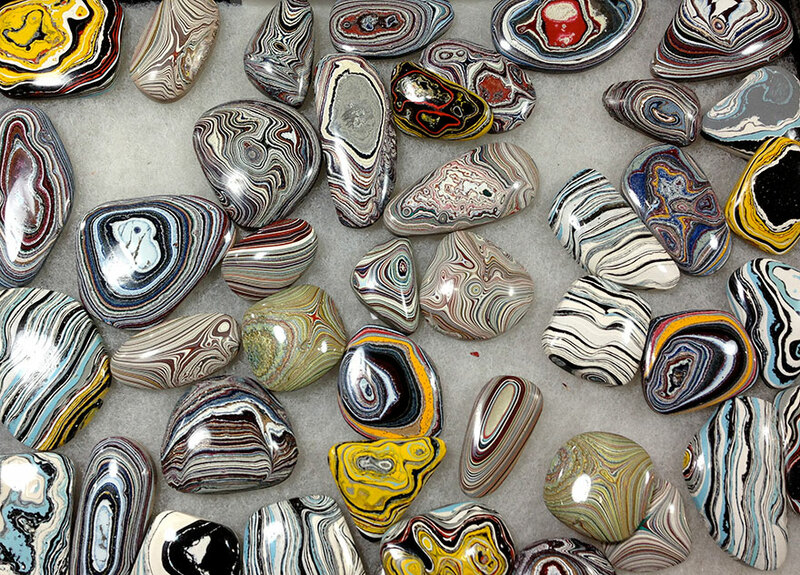 Jewelry designers polish this layered material to reveal the multiple ribbons of color and mount them as they would any stone in necklaces and earrings. As Detroit can no longer supply this material, older slabs must be "mined" from retired factory workers and old sites, but interest continues unabated in this colorful artifact made from upcycled automotive history.